Technivorm-Moccamaster KBT is a name many of you are probably unfamiliar with. Handmade in the Netherlands, Technivorm-Moccamaster coffee makers may not be as well-known as other brands, like Keurig and Mr. Coffee, but the brand produces great quality machines that can brew a mean pot of coffee. We had the chance to give the Technivorm-Moccamaster KBT 10-cup brewer a test drive recently while staying with a friend. 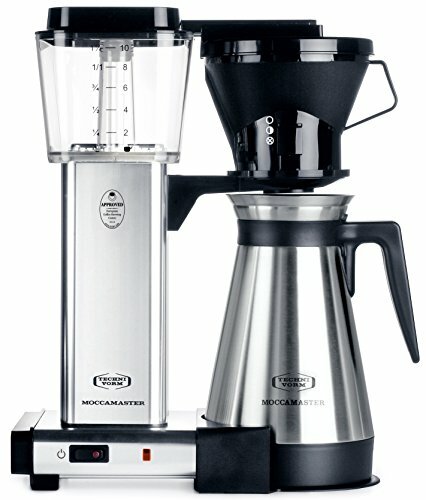 Just one look at the Technivorm-Moccamaster KBT and you can tell it’s extremely well-made. The exterior is primarily made of stainless steel with black plastic accents – which are all BPA-free, by the way. This machine is SCAA (Specialty Coffee Association of America), ECBC (European Coffee Brewing Center) and SCAE (Specialty Coffee Association of Europe) approved, so you know it’s made with top quality materials and brews a great pot of coffee. Unlike other coffee makers, the KBT uses a copper heating element that heats the water to a consistent 196-205 degrees F. A special pulse action ensures the perfect bloom during extraction. 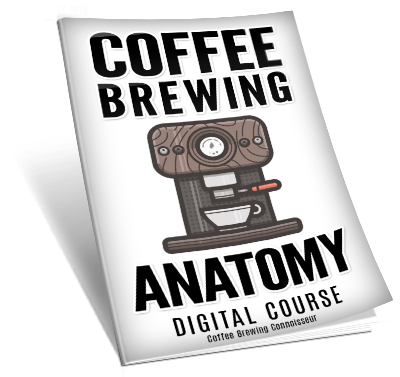 Once the brewing cycle is complete, the heating element shuts off automatically. There aren’t a whole lot of features or buttons with this machine. A simple on-off switch, water reservoir, carafe and filter basket are really all you need to enjoy a great cup of coffee. The water tank has markings, so you can easily measure your water. The KBT has a minimalistic, compact design, which was a pleasant surprise. It won’t take up a whole lot of counter space, which makes it a great option for small kitchens and apartments. 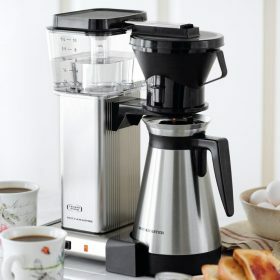 And it can brew a full 10-cup carafe or 1/2 carafe in just 4-6 minutes. Forget spending 10-15 minutes cleaning stubborn filter baskets and water reservoirs. The KBT is very easy to clean. The steel exterior wipes clean with a sponge or damp towel. To descale, just run a cleaning cycle with vinegar and water every month or so. Thanks to its minimalistic design, maintaining the KBT is a breeze. If you’re looking to invest in a coffee maker that will give you years of use, the KBT is a great choice. It’s backed by a 5-year warranty and is built with high quality parts, including a stainless steel exterior and copper heating element. And because it has a simplistic design, there are very few parts you need to worry about breaking. The Technivorm-Moccamaster KBT is a mid-range coffee maker with high-end quality. You’d have trouble finding another coffee maker in this price range that produces a better pot of coffee. A few users had a problem with the reservoir leaking. When we tested the KBT Technivorm-Moccamaster, we never had an issue with the reservoir leaking. The reviewers who did probably didn’t use the machine properly. The Technivorm-Moccamaster KBT brews coffee at just the right temperature every time. With a minimalistic design and affordable mid-range price, we fall in love with Technivorm-Moccamaster KBT at first coffee! Which Is The Best Espresso Maker?